French fishermen protesting against EU fishing quotas have lifted their blockade of three Channel ports. Ferry traffic is resuming between Britain and Calais, Dunkirk and Boulogne. The fishermen said they would continue protesting in different ways. The French government has rejected demands to renegotiate the quotas. But the fisheries minister has offered 4m euros in aid to the fishermen. Ferry operator P&O has condemned the government for "rolling over". Chris Laming, director of communications for P&O, said he feared it was "very likely" the strikes could return because of how the French government had handled the situation. "It's a pattern that we've seen repeated before. They simply roll over every time and give in," he told the BBC. "France has a legal obligation under the EU Treaty to keep that border open for the free movement of goods and people. They simply don't follow their responsibilities," he complained. The protest, which began on Tuesday, has caused severe disruption for thousands of holiday-makers and hauliers trying to cross the Channel, with long queues forming in both France and the UK. The decision to call off the blockades came after a meeting of the French fishing unions. But the unions appear to be divided over the decision and further meetings have been called for which could result in a resumption of the blockades, the BBC's Dominic Hughes in Calais reports. 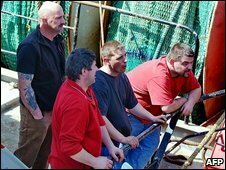 The fishermen are protesting at EU fishing quotas which they say have drastically reduced how much cod they can catch. "We are going to continue our movement to show we are mobilised, but we are going to change our type of action," said union leader Bruno Dachicourt. He said the fishermen would focus on protests on land after talks with Fisheries Minister Michel Barnier produced promises of financial help. Mark Mardell: Time to get tough? Regarding the fishing quotas which were set by the EU in December, Mr Barnier refused to renegotiate the cod quota, pointing out that the quotas for parts of the English Channel were actually increased by 30%. But he said he was negotiating to obtain an increase in the French sole quota, by trading fishing rights with other EU member states, AFP reported. He said he would meet EU Fisheries Commissioner Joe Borg later this month to discuss the system. He added that struggling fishing companies would be eligible for loans of up to 50m euros, AFP reported. On Wednesday, he offered 4m euros in aid for fishermen forced to remain on shore, as well as loans for indebted fishing companies. Patrick Ramet, a fisherman from Boulogne, said the quotas prevented them working and earning money. "When the minister says he obtained an increase of 30% on cod fishing in December, it's true. But that leaves French fishermen 9,000 tonnes for 2009. In 1993, the quotas were 150,000 tonnes," he told Le Parisien newspaper. "I am allowed to fish 10 tonnes a year. If I want, I can fish this quantity in a week. Since the beginning of the month I am no longer allowed to fish cod, soon we will reach the quotas for hake... In short, it's impossible to work." Experts have warned that without severe cuts in fishing catches, stocks of some fish in European seas could be virtually wiped out. Ferry passenger Rafla Reszelluska, a Polish builder living in North Finchley, north London, who endured a long wait at Calais, said: "I'm very relieved. It's been very frustrating and I have had enough. "This is none of our business, we just want to go home." P&O said a backlog of cars and lorries at Dover had been cleared by 0830 BST (0730 GMT) on Thursday but warned that long delays would again be likely if the fishermen chose to re-impose their blockade.